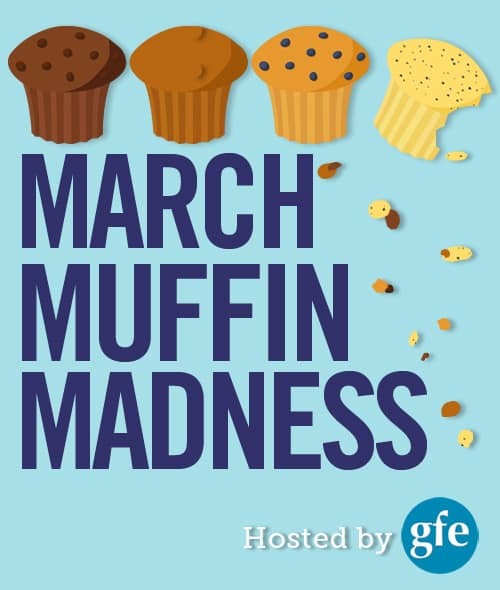 Welcome once again to March Muffin Madness (MMM)! It doesn’t seem possible, but each day I get more and more excited about the muffin recipes, the daily prizes, and the overall/grand prize offering that I get to share with you all! I hope you’re getting more excited about MMM as well. Today’s post has more of a kid focus, which I love—with an adorable little one “modeling” today’s muffin recipe, Baby’s First Muffins. 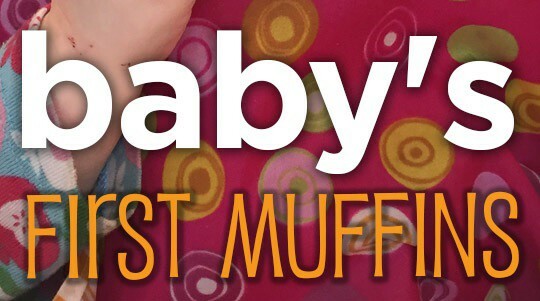 Today my good friend Maggie of She Let Them Eat Cake is sharing her newest muffin recipe, Baby’s First Muffins. This is a very special recipe because she developed it for her youngest “babe,” as her first birthday was approaching. Maggie didn’t want to go the traditional birthday cake route (she explains in her post). Instead, she created some really healthy and tasty muffins that she felt comfortable giving her daughter. 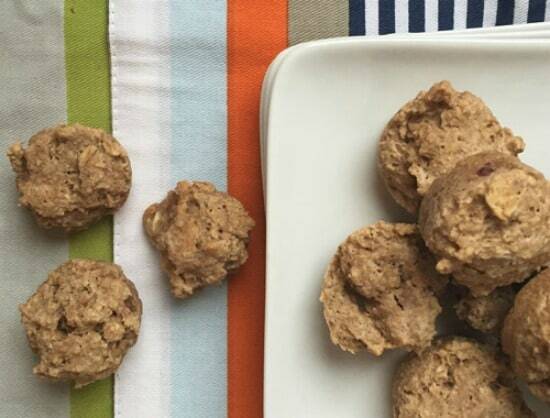 Her muffins are made using certified gluten-free oat flour and oats, and sweetened using fruit. (Important: Always use oats sourced from purity protocol oats; see the listing of companies that use purity protocol oats here.) Maggie made her muffins as minis because she says mini muffins fit perfectly in a little one’s hands. She’s right! They’re also a nice bite-sized version that works for adults, too. I’ve made a lot of Maggie’s recipes over the years and have adapted others, or have been inspired enough by them to create a new gfe recipe. Some of my favorite recipes of hers are: Almond Dream Shake, Blueberry Buckle, Double Chocolate Chip Cookies, and Triple Chocolate Pudding Sandwiches. I know you’re ready to head over to get Maggie’s Baby’s First Muffins recipe, but hang on just a minute because you’re definitely going to want to enter today’s giveaway and be sure that you get all your entries for the overall/grand prize giveaway, too. UPDATE: This giveaway is now closed, but please check out these amazing resources for children and their parents, teachers, etc.! 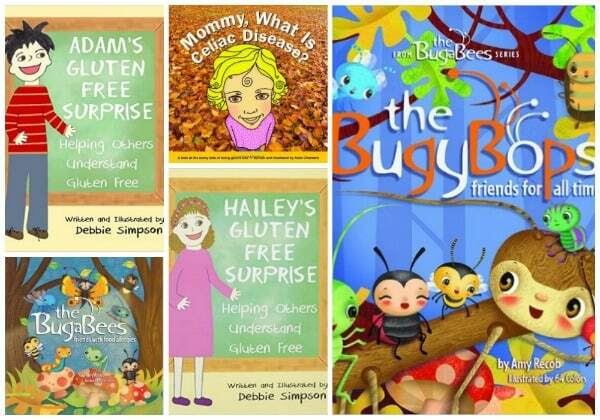 Every time I share children’s books that deal with living gluten free or allergen free, readers tell me that they didn’t know these books existed. While I’m happy to be the one to introduce such wonderful resources to my gfe readers, I’m always a little upset that these books tend to fall under the radar. 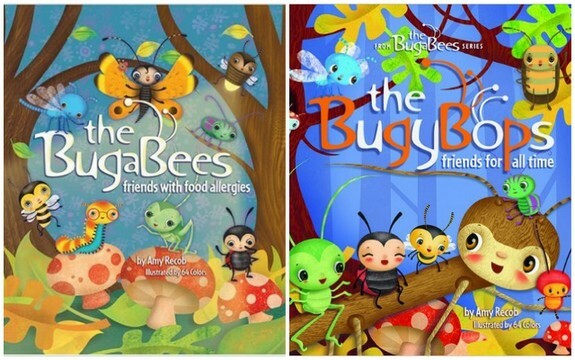 Earlier I shared The No-Biggie Bunch series (enter the giveaway for them here) and today I have 5 more terrific books written to help children who are gluten free and/or have food allergies. I encourage you to not only enter the giveaway, but to also spread the word to others that these very valuable books are out there! You can read my full review of this terrific book from my friend Katie Chalmers of g-free kid (blog and Facebook page), but you can see why I like this book so much simply from its subtitle, A Look at the Sunny Side of Being a Gluten-Free Kid, and its captivating cover. Katie’s book is a straightforward, positive read with beautiful illustrations. 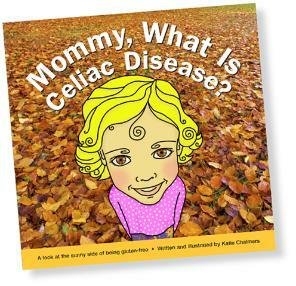 It’s the perfect introduction to celiac for most children. Thanks so much to Katie for sponsoring this giveaway! 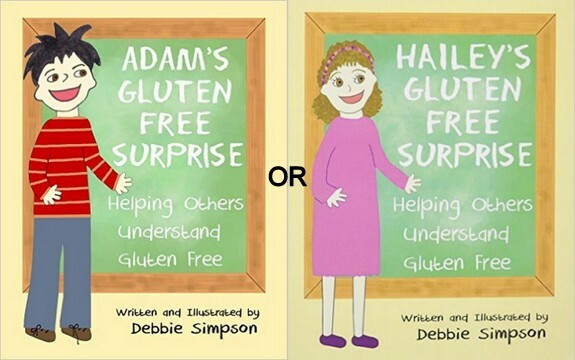 Debbie of DSimpson Books and Gluten-Free Respect has written several versions of her Gluten-Free Surprise books (e.g., Adam’s Hailey’s, Gabriel’s), gearing them to different sexes in the hopes that they can be more relatable to the individuals reading them. The goal of her books is to educate all in the gluten-free world on how to support and keep a gluten-free child safe and happy. Therefore, her primary intended audience is parents, teachers, nurses, and the like, but she quickly discovered that her books are also directly helpful to gluten-free children as well. These children read about Adam’s or Hailey’s experiences and recognize the situations they’ve been in themselves after going gluten free. Just knowing they have that shared experience helps them. But the books also show them how to work through the situations, with the aid of the adults around them as well as their classmates/peers. Thanks to Debbie for sharing her books with us! 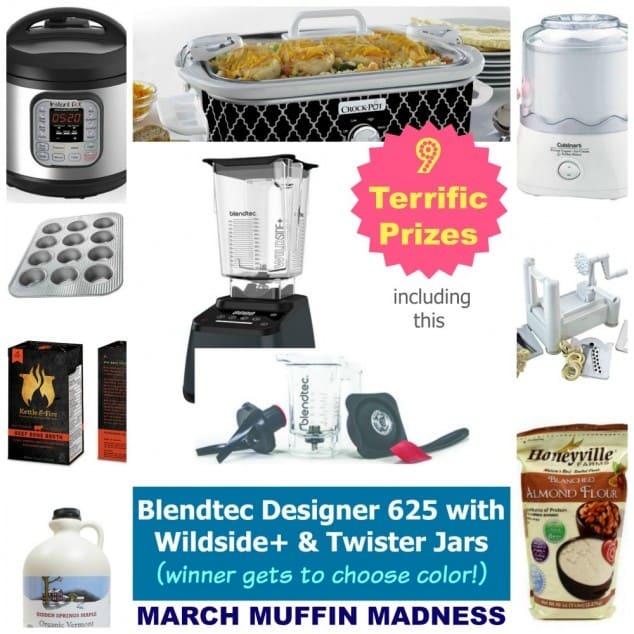 Be sure to enter the overall/grand prize giveaway at the bottom of this post and come back tomorrow for another terrific gluten-free muffin recipe and another daily giveaway. Again, remember that commenting on every post during the MMM event gives you additional entries into the grand prize drawing, which includes the following, so be sure to spread the comment love here and on participating posts! You can see the up-to-date listing of daily prizes and the complete lineup of bloggers and recipes in the kickoff post here. These books are really cute!! And that muffin recipe looks good. HAVE REALLY ENJOYED ALL OF THE MUFFIN RECIPES. THANK YOU FOR GIVING ME THIS LOVELY OPPORTUNITY. Have a great grandson who will soon be 1 year old. He has a few allergies and I can’t wait to try these out. He just loves to be able to eat something new. Thanks for the recipe. These look great, and my daughter will love them. What an awesome idea to make baby gf muffins! I’ll come back to these when my grandbaby is ready for them!